The 6-Section Heavy Duty Clamp Carrier is our most affordable Heavy Duty Clamp Carrier. Still, it includes most of the deluxe features of our larger machines, including super heavy-duty zinc-plated clamps, Pneumatic or Hydraulic Clamp Tightener, Pneumatic Panel Flattener and Electric Motor Drive. 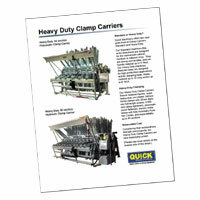 For more information on our 6-section Heavy Duty Clamp Carrier, please click on the image to the left. 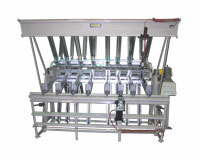 The 14-Section Heavy Duty Clamp Carrier is our mid-size Heavy Duty gluing machine. Still, it packs in all of the deluxe features of our larger machines, including the 1-button fully Automatic Carrier Rotation Cycle. For more information on our 14-Section Heavy Duty Clamp Carrier, please click on the image to the left. Our 20- to 80-Section Heavy Duty Clamp Carriers are designed for high production and super durability. The frames on these machines are the heaviest and stiffest in the industry, with oversize frame rails and runways, 3" diameter front and rear shafts, heavy-duty chains with 2" wide rollers, large cast iron sprockets, and massive 6" I-beam legs. For more information on our 20- to 80-Section Heavy Duty "High Production" Clamp Carriers, please click on the image to the left. Our Automatic Clamp Carrier brings full automation to the panel clamping process. 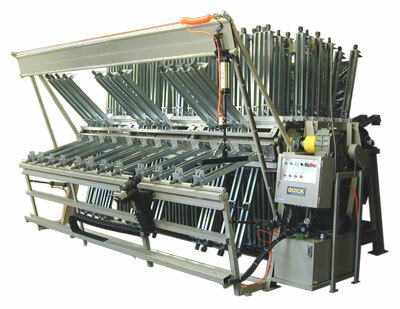 After loading the clamps with stock, the operator simply presses the "Cycle Start" button, which commences the machines fully automatic clamp tightening, Carrier rotation, clamp loosening cycle. 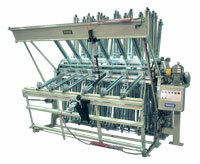 For more information on our Automatic Clamp Carrier, please click on the image to the left. QUICK Heavy Duty Clamp Carriers feature many competitive advantages, including massive frames, super heavy-duty zinc-plated clamps, high clamping forces, torque-limited Hydraulic Clamp Tighteners and fully Automatic Carrier Rotation Cycles. For more information on the competitive advantages of our Heavy Duty Clamp Carriers, please click on the image to the left.